Eco action toppers is a clever environmental twist to the perennial favourite game ‘trumps’. We’ve re-invented the trumps idea, and recently changed its name for obvious reasons, and created an educational, highly entertaining game that gives players, both young and old, lots of simple and easy ideas of what they can do to help the environment whilst trying to beat their opponents to become the eco action toppers champion. 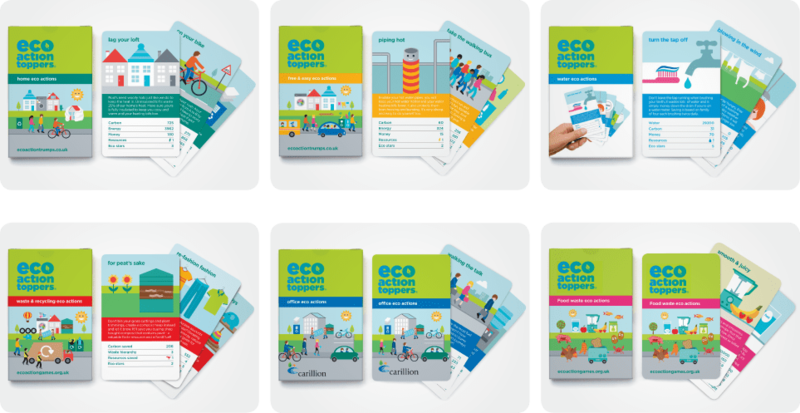 There are eight eco action themes available: home actions; free & easy (behavioural actions that cost nothing to do), water saving, office actions, eco parenting, energy saving, waste & recycling and food waste. All cards show how much carbon, energy, water, money and other resources you save when you adopt the action displayed on the card. Individual packs are for sale in our shop. For larger purchases (10s, 100s, 1000s) please contact us here to discuss bulk purchase discounts. The giant size version of eco action toppers (A4 size cards) are available to purchase individually (£75 per pack ex VAT and P&P) or as part of the giant eco action playground set. For more information about the cards themselves and details on how to order multiple packs or to commission a personalised pack with your company’s logo (see the above office actions pack for an example of a branded version) and details of your environmental credentials, contact us here. Our free App is available from the iTunes App store – for the iPhone, iPad and iPod touch (no Android version currently – sorry). Simply search for ‘eco’ in the iTunes App store – we are the number 1 result, and download the game for free. This game is completely free to play, there is no In-App purchasing so kids can play to their heart’s content without running up a huge bill. Or, if you are viewing on an iPhone or iPad, then click here to go straight through to the App in the store to download it instantly and get playing. Thefree App contains two games to play, the traditional trumps game, and a variation where you get to pick 10 actions and then play them against two opponents. Plus there is a handy little tool which allows players to log all of the eco actions they do, or intend to adopt, on their own ‘eco action dashboard’, this dashboard also calculates all the energy, carbon and money savings that the user is making through the actions. Who doesn’t like a game of good ol’ snakes + ladders? Our giant eco action snakes + ladders board is loved by all, from the very young to the very old. We have taken the general principle of the game, that is: ladders are good, and snakes are bad, and used it to produce a simple yet effective educational resource. When you land on a good environmental action you climb the ladder, but get stuck on a wasteful bad habit and you go sliding down a snake – there are over 20 eco learning points on every board. The table-top size version is made from recycled, varnished, durable card, with six laminated counters and a cardboard spinner, this traditional old favourite has been given an eco theme by adding good and bad eco habits to the board. These can be purchased from our shop. The extremely popular giant version (2.5 m2) of the board, made from a durable, very hard-wearing pvc plastic is always a favourite at events and festivals. This version is suitable for both indoor and outdoor play – it comes with metal eyelets to allow it to be staked to the ground. Prices start at £299 (ex vat) for the 2.5 metre square version – and you can also have your logo added to three of the squares for just £50 extra (or free if you buy more than one), and we can also create unique bespoke versions for your exact needs. Please contact us for more information on personalisation options and how to commission a branded version. A lighter, more portable version of the giant game, made from 100% recyclable polyethylene, is included in the giant eco action playground set. 8 ‘eco action’ themes: everyday; free & easy behavioural; water saving, energy saving, waste + recycling, food waste, air quality and office eco actions. So, we’ve all played twister in our childhood – yes? Well now is your chance to relive the fun but also show off how many eco actions you do at the same time! It’s loosely based on the old favourite, with an eco twist! You can only move on the eco action twist mat if you do the eco action (and no fibbing!) that is chosen by the referee by spinning the arrow on the eco twist board. The last eco warrior standing is the winner! The giant mat (1.8m2) is made from 100% recyclable polyethylene and is both light and strong. The spinner board is made from a mix of post consumer waste and FSC card. It comes in an organic, ethically produced canvas bag for easy storage and transport. It can be purchased through our online shop and is also part of the giant eco action playground set. Eco bingo is a unique take on the much loved, well-known, traditional game; but we have re-imagined it and given it a eco twist to create – eco action bingo. eco bingo works like normal bingo, but instead of just calling out numbers, we have assigned each number an environmental action that most people can do at home, at school or at work. The action is described in a simple, sometimes rather cheesy, rhyme – that links to the number. The eco bingo caller recites the rhyme and then the number, the actions get crossed off the bingo cards and the first player to cross off all their actions gets to shout ‘eco bingo’ to win the game. It’s as simple as that! The eco bingo pack consists of 15 bingo playing cards (one for each player), each with 12 eco actions highlighted, with reusable covers, a bingo caller card that displays all 30 actions, a leaflet that explains the rules as well as giving more information on the actions featured, a set of 30 bingo 2-D ‘balls’ and the cotton bag which serves both as a container for the whole game and as the bingo caller’s ball bag. Vey portable for those impromptu bingo sessions on the go! It’s a complete bingo set in a bag. Available for purchase individually from our shop, and also as part of the small compendium set and the giant eco action playground. It come in five themes: everyday, office, water, waste & recycling and food waste. Higher? Lower? Do you remember the catchphrase? Play your eco cards right is our eco educational game loosely inspired by the classic TV quiz show. The cards describe a variety of environmental actions people can do at home, at school, whilst travelling and at work. Each action has an estimated carbon (or water) saving that results from adopting the action. Teams have to guess whether one eco action will have a higher? or lower? carbon (or water) saving impact than the action that comes before it. The game consists of 30 A4 full colour, durable, laminated cards. There is also an ‘instruction for play’ card and question card in the set. There’s six themes available: everyday, free & easy, water saving, energy saving, waste & recycling and office actions. They are available for purchase from the shop, but also form part of the giant eco action playground set.